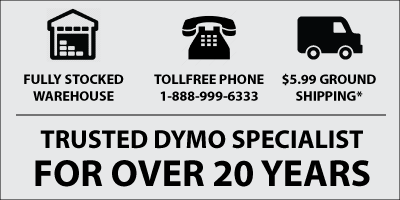 The Dymo LabelWriter 450 DUO is very unique for a Label Printer because it uses two totally different label systems. First, like all LabelWriters, the DUO uses traditional Dymo LabelWriter die-cut labels (labels that have been pre-cut to certain sizes and shapes) such as Address, Shipping, File Folder, Name Badge, Jewelry etc. Where the DUO differs is that it also uses Dymo's D1 label cartridge/tape system. D1 labels are predominantly made from a plastic material and come as a long strip which is cut to size by the label machine. D1 labels are available in a wide variety of colors and tape widths and are more durable than traditional LabelWriter labels, being resistant to UV, water, oils and light solvents. - Press the button on the front of the printer to open the label cassette tray.